Glucosamine and chondroitin sulfates occur naturally in Deer Velvet and interact with other unique nutrients for optimum effect. Types A, B and C – attract the cushioning fluid back into the cartilage, which acts as a shock absorber and brings nourishment and lubrication to the cartilage. Chondroitin has an anti-inflammatory effect. It helps inhibit the breakdown of cartilage, and contains helpful enzymes which remove damaged cells. An important ingredient in the production of the proteoglycans or water holding molecules in cartilage. The more glucosamine the more proteoglycans. Glucosamine is also necessary for the production of the thick synovial fluid in the joints. 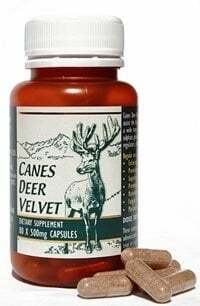 The glucosamine and chondroitin in Deer Velvet are understood to interact with the growth factors in the velvet resulting in increased absorption of the chondroitin and glucosamine. As we age our bodies produce less glucosamine and chondroitin naturally. Arthritis, joint injury, or heavy training schedules all put a greater demand on the body for these nutrients. Using supplements can have excellent results given time to allow healing to take place.